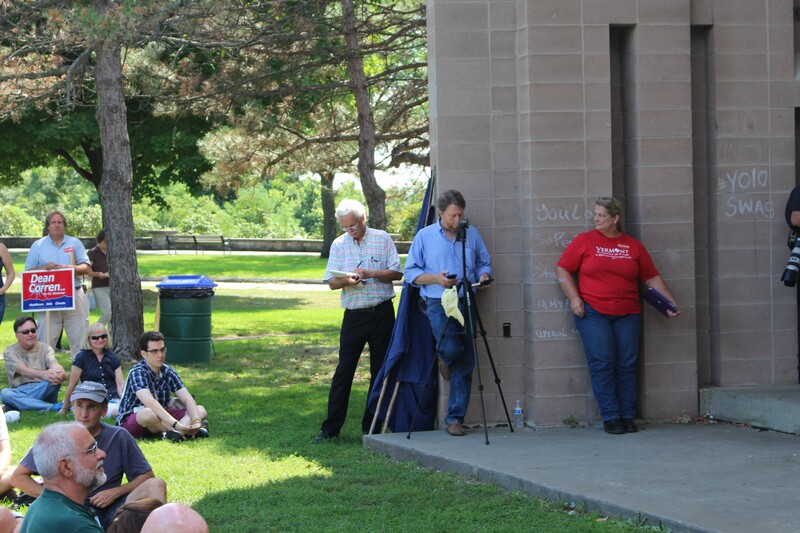 Hemingway takes notes at Sen. Bernie Sanders' Labor Day rally at Burlington's Battery Park in September. After 37 years at the Burlington Free Press, veteran newsman Sam Hemingway plans to retire later this month. "I'm 66 years old and I'm looking forward to doing other things with my life," he says. "It just seemed like a good time to do it." Hemingway announced his departure to colleagues Tuesday afternoon, the Free Press reported shortly thereafter, telling them, "I will miss you, and I will miss this work, so much." The Connecticut native moved to Vermont in 1971 and joined the Free Press staff in 1977. In the 1980s, Hemingway edited the paper's Sunday magazine and then served as city editor. From 1989 to 2005, he wrote a thrice-weekly column that ran the gamut from politics to investigative reporting to more lighthearted fare. "I've never had a beat at the Free Press. I was always sort of a generalist," he says. According to Hemingway, career highlights included his coverage of a North Troy weapons manufacturer accused of violating the apartheid-era embargo of South Africa; Howard Dean's 2004 presidential campaign; the Vermont National Guard's 2010 deployment to Afghanistan; and the state's ongoing struggle with opiate abuse. He says he's just as proud of "the stuff that people won't remember as well," such as Burlington's deadly outbreak of Legionnaire's disease in 1980. Hemingway's announcement comes less than two weeks after Free Press publisher Jim Fogler announced his own plans to depart the paper and just as corporate parent Gannett Company, Inc., prepares to cut a reported 15 percent from newsroom budgets companywide. But according to Hemingway, his plans were not influenced by Gannett's. "I've been thinking about leaving the Free Press on my own terms for quite some time," he says. "I love the Free Press and, to me, it's an important piece of the Vermont media scene. I hope it always will be. I'm leaving it on great terms. It was time for me. I'm 66 and looking to do other things: spend time with my grandkids and travel some more and all that good stuff." Hemingway says he's proud to have called Vermont home for most of his career. "I love this state with all my heart," he says. "It's been a fascinating place to be a reporter. You know, I've been treated well by Vermonters, for the most part. I know I've upset them from time to time, but I've had a great time in my career at the Free Press. I have no regrets."